I was extraordinarily skeptical as to how Ant-Man was going to turn out. I, like many people, couldn’t really take the idea of Ant-Man seriously. It never felt like the movie could be a great success…but there were people who thought that same thing about Iron Man, too. Ironically, the results are rather similar. Ant-Man tells the tale of Scott Lang, an ex-thief who must team up with mysterious scientists, Hank Pym and Hope Van Dyne, to keep a powerful suit away from dangerous hands. Ant-Man strikes a spectacular balance between funny and focused, and the result is one of the most character-driven Marvel movies since Iron Man. It’s a superhero movie that doesn’t really feel like a superhero movie, but it works so well for what it truly is: a great heist movie. 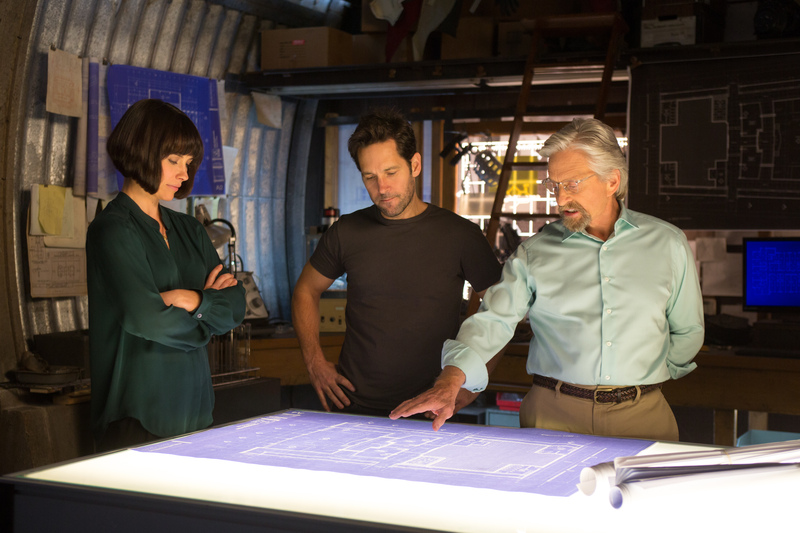 L to R: Hope Van Dyne (Evangeline Lilly), Scott Lang/Ant-Man (Paul Rudd) and Hank Pym (Michael Douglas). 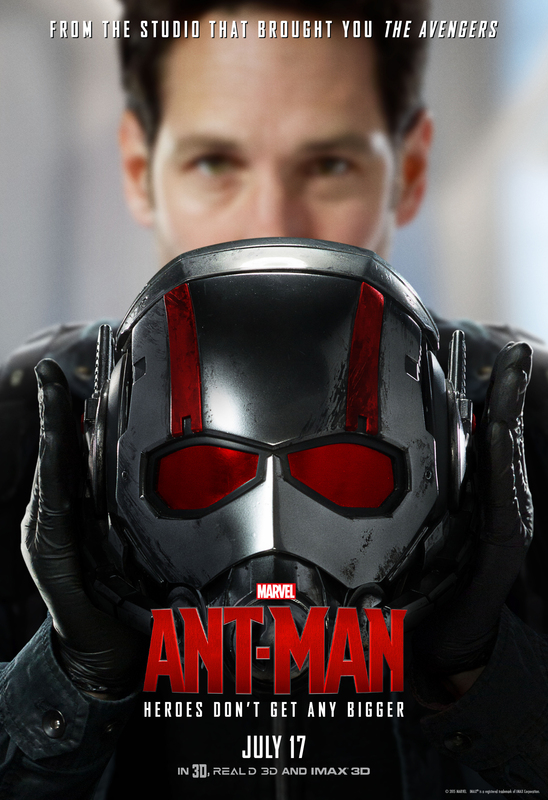 While Paul Rudd’s Scott Lang is technically the main character of the story, the movie revolves around the whole concept of Ant-Man. This works because of how amazingly well Michael Douglas, Evangeline Lilly and Paul Rudd all mesh together. The chemistry between these three is as good as the team dynamics in other Marvel movies like Guardians of the Galaxy and the Avengers. The spotlight is on the team as a whole, not just Scott Lang. It’s also good to mention that Corey Stoll gives his all in the role of the villain, and Michael Peña churns out one hilarious line after another. I was also impressed with Ant-Man’s story. As I said earlier, this doesn’t feel like a superhero film or an origin story. Ant-Man is a heist movie, and it does well at feeling like one. It’s something unlike anything Marvel’s done before and it works to just the right degree. What I really loved is that Scott Lang isn’t becoming a superhero and joining a universe. Well…in the grand scheme of the MCU he is, but in this movie, he’s just a guy who gets wrapped up in someone else’s story and ends up doing a one-time job. In this regard, Ant-Man is a bit of an anomaly. It looks like this big budget action flick on the surface, but once you get past the advertising and into the theater, the whole film plays out as this personal character-driven story. Scott Lang is the Ant-Man. That feeling of “more than meets the eye” carries over into the tone of the film, which is a small-scale action/sci-fi/comedy. Action and humor mix together brilliantly here – it’s most noticeable in the outstanding third act – but what really grabbed my attention was how well this movie did at breaking through assumptions and expectations. It’s a superhero movie…but not really. Scott Lang is the way he is for some stereotypical reason…but not really. Ant-Man dives into the “chosen one” trope…but not really. Hank Pym wants to save the world…but not really. I know that seems super vague, but trust me. You’ll understand once you see the movie. Which, if you haven’t caught on yet, is definitely something you’ll want to do. While it had some scenes and cameos that were really cool for Marvel fans to see, these felt like they were patched on to something that didn’t really need them. Ant-Man is such a different story than other Marvel movies, so when you see something that tries to connect it to the MCU, it takes you out of the experience a bit…even if those particular scenes do end up being awesome. Also, Marvel continues to have a seemingly unshakeable problem with one-off villains. Corey Stoll’s Darren Cross is the same old rich white guy that shows up in other Marvel movies (Iron Man 1, 2 and 3, The Incredible Hulk, The Winter Soldier). Don’t get me wrong though: Stoll tries, and I applaud him for that. He tries SO hard to make his character somewhat interesting, but he can’t seem to overcome the terrible manner in which Cross is written. Here’s a hint, Marvel: if a villain is laughing when he’s trying to kill the hero, you’re probably doing it wrong. Unless your villain is the Joker. Ant-Man surprised me by how entertaining and focused it was. It’s the most personal story Marvel’s put out there since Iron Man, and it is absolutely worth your time. P.S. Stay after for both end credit scenes.